Check out this Handbook below. 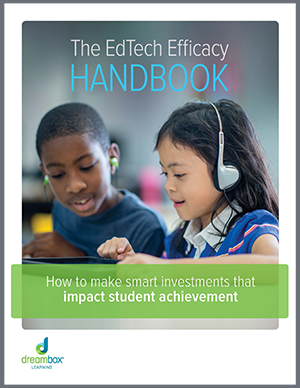 DreamBox Learning Releases EdTech Efficacy Handbook to Empower School District Leaders to Critically Evaluate Math Learning Programs and Software and how to make smart investments that impact student achievement. This handbook offers examples of the kinds of independent efficacy studies and district use cases educators and district leaders should seek out and validate before investing in education technology, and shares best practices for evaluating those studies. DreamBox Learning writes in the introduction, "If your district or school is in the market for education technology programs, it’s essential to find and validate evidence of efficacy before you adopt and purchase." Third-party studies are essential, as is research conducted internally by school districts. In this guide for district leaders and educators, we’ll explain why you should insist on both—and show you where to find evidence-based information on solutions that truly move the needle and improve outcomes.